SURPRISE! I thought I didn’t want to run this again?! So, one year ago I celebrated finishing the third leg (10 miles) of the Vermont City Marathon Relay, having run with a 3-person turned 2-person relay team (I ran the 10 mile leg). I enjoyed the race, my legs felt amazingly good, and I toasted never having to run the race again. Done and done. Apparently my resolve only lasted a year. Same friend; another teammate shortage; same outcome—I’m running. This time I ran the 1/2 Marathon relay. So once again I find myself running a road race—not overly excited about running on the roads, but adequately trained and coming to realize that diversifying the type of running is probably best for your overall fitness. Our combined-relay time was just under 3:30. Dharma ran a 1:41 and I ran a 1:45; not my best half marathon but certainly nowhere near my worst. It demonstrates to me that even with a small amount of training I can drop into a half marathon and do decently well. 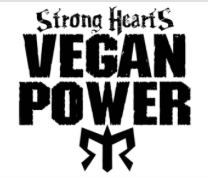 It also helped that I wore my “Strong Hearts Vegan Power” shirt—this always gets me lots of cheers and provides a real morale boast. I’d say that I’m not going to run this ever again, but we know how far that got me last time.